Avoid Buying Chinese Products In India. 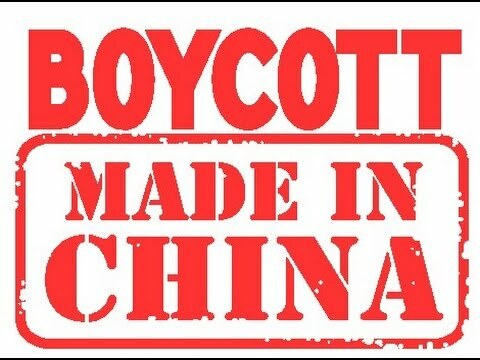 Say No To Chinese Products. I love my country and countrymen. I am not going to buy any Chinese Crap this festival season. Festival season has already arrived and as expected, parking inspectors are already losing their cool; shopping gallerias are already facing parking problems. Shopkeepers are busy counting money and people like you and me are busy swiping the credit cards; seems like we all were instructed to hold our desires until festive seasons. But, in this hullabaloo, we always forget to notice people sitting on the footpaths with clay lamps, sculpture, pitchers, and many other handicrafts? Not your fault, though, like our confusion between “real heroes (army men) and ‘filmi heroes‘ (movie star), we have hypocritical opinions about patriotism as well. Be its electronic products, machinery, chemicals, fertilizers, iron or steel product, plastics, mineral fuels and oils mobile phone, televisions, clothes, shoes, decoration lights; everything is carrying a made in china tag. Do you know, the Chinese market is not only eating our domestic market, but our culture and heritage as well. Do I really need to tell you anything about the hole? Say no to Chinese products because you are not buying their scrap, but you are funding them and you are proving yourself as a reason behind a countryman’s death. Chinese products are already dominating our market. If we go by figures, our imports from China have already crossed the figure of $235B. And, this is only increasing. People say they don’t go to no China to buy these Chinese products. It is our Government allowing them to sell their waste here. But, let me tell you, Government cannot really ban the import of Chinese goods because it will be against the norms of World Trade Organization. Also, it is not an easy thing to do. Congratulation – After supporting Pakistani Actors, we are also showing our best support to our second biggest competitor. Are we really loyal to our country? I can multiple reasons, but that would be long. Let me keep things precise. China has still not made a slight move towards democracy. According to reports, the trade deficit between China and USA stand at $230B and one day, it is going to shake the whole world’s economy. Chinese Government has a history of always showing inhuman aggression towards other countries. Test your memory or explore Google, who always backed Pakistan? All I want to say is – can you give me a single reason for not putting our money in the hands of democratic countries in Europe, Asia and others. On humanitarian grounds, we all know the reason behind cheap Chinese labors; a Chinese cup your baby is having his milk, is made by another baby under pathetic working conditions. Also, it is about buying standards products and we all know how fake Chinese products are. Aren’t we turning fake? I don’t think so, our standards for quality of goods are so low that we now have to rely on their ‘good for nothing’ products. In addition, do you know that China is polluting the World and endangering human life? With their cheap product, they are also killing local industries. Most of their product are copied, and are made of significantly low standards; again a risk to our health. Look around. Many countries like West Philippine, Vietnam have already stopped buying their useless products with inferior quality. As per the latest economic reports China stock loses $3.2 trillion in weeks. Stop buying Chinese items and save your domestic art. I know , most of you are going to say that domestic products are expensive. But, can I just ask you – would be buying a Chinese medicine substitute for your baby, if domestic medicine of the same salt is expensive? I hardly doubt. Bring a smile on the face roadside seller. Buy a clay lamp from him and help him celebrating Diwali. There is no comparison between the beauty of sparkling clay lamps and fake Chinese lights. Promote domestic products and show true patriotism. By not buying Chinese products, you will give your contribution for the betterment of mother nature, humanity, environment and local talent promotion.